Go link up with C Mae and show us your favorite picture of your furbaby or in my case furbabies! 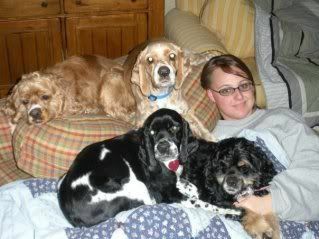 This is my favorite picture of me and my pups. It was shortly after we rescued Tony and Moo Moo in 2008, when they were two years old. I think it's the only one actually that has all four of them AND me. Oh my gosh... that is the cutest picture ever! I'm partial to spaniels so I love this! I have a brittany. Growing up, I had a cocker spaniel! Love this pic! What a cute picture! Your pups are adorbs! What a cute picture! We have 3 pups so I know the feeling of trying to get all three in one picture.